The Invitation is a home invasion movie that remains contained. It is a film about paranoia that keeps each potential threat within each characters field of vision. It is a film of formalities and the edge of such expectations some can be pushed to before destroying such pleasantries in order to cut through one another with the truth. At least, truth from a certain perspective. And that is the key to this largely successful horror/thriller as it operates within the realm of a certain number of perspectives with our lead constantly forcing us to question his particular view and if it is reliable or not. Director Karyn Kusama (Girlfight) mounts the film as a dinner party gathering between old friends coming together at the request of a couple they haven't heard from in years. 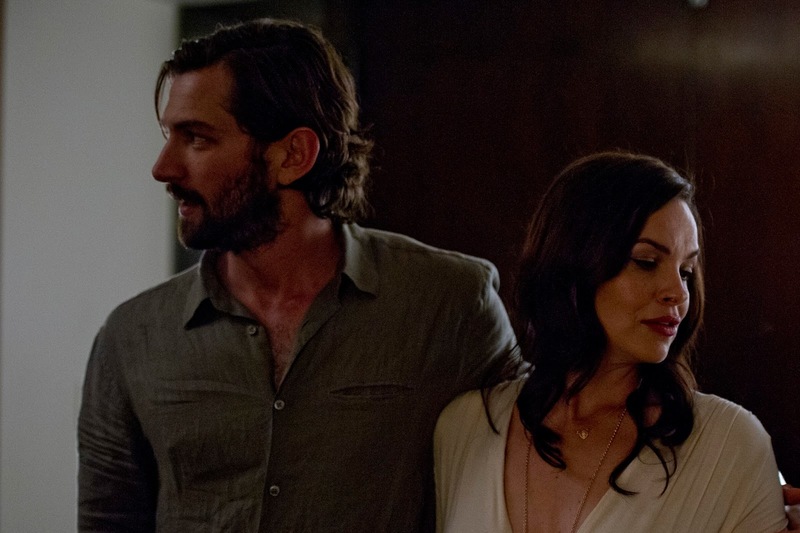 Immediately the circumstances are strange as our protagonist, Will (Logan Marshall-Green of Prometheus), questions the motivations of both Eden (Tammy Blanchard) and her new husband David (Michiel Huisman) as they seemingly have little interest in re-connecting or beginning relationships anew, but rather have brought their once close-knit circle of friends back together for reasons that are both mysterious and ultimately selfish. While The Invitation is certainly a tense and involving film it is also an experiment in how slow one can actually drag out the burn of its mounting anxieties and confusions. There is an interesting and excellent forty-five minutes within what we're treated to here, but dragging the events out to full feature length make long stretches of the film feel more tedious than tense. That said, when the film is on a roll it is indeed on fire and with a very distinct aesthetic, a haunting score from Theodore Shapiro, and truly affecting performances most notably from Marshall-Green and Blanchard, The Invitation proves to be a gathering worth attending. 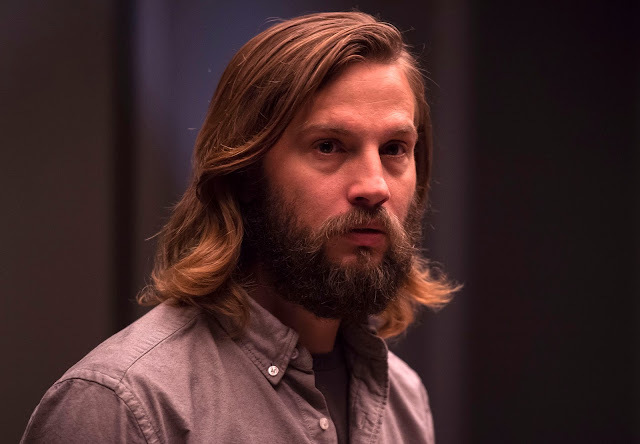 Will (Logan Marshall-Green) attends a party hosted by his ex-wife in which things take a turn for the worst. Screenwriters Phil Hay and Matt Manfredi begin by introducing us to Will, a bearded but well put-together man with a beautiful woman by his side (Emayatzy Corinealdi). It's clear the couple is semi-serious, but not married and not sure whether that is the direction they'll ultimately take. They drive through the Hollywood hills, tepid about their destination with the circumstances of their arrival largely unknown to the audience. It is on their drive that a frighteningly staged collision with a coyote takes place. The impact of the car doesn't immediately kill the animal though, and so Will is forced to put the animal out of its misery. It might seem an event solely planted in order to heighten the already taut tone, but as we'll learn there is much more of an allegory at play here. Upon arrival, things seem to more or less be as any gathering would be where friends haven't seen one another for an extended period of time. We are introduced to the homely Claire (Marieh Delfino), gay couple Tommy (Mike Doyle) and Miguel (Jordi Vilasuso), intended comic relief Ben (Jay Larson), and Gina (Michelle Krusiec) who awaits the arrival of boyfriend Choi (Karl Yune). As Will both embraces the friends he hasn't seen in years and introduces girlfriend Kira (Corinealdi) to the group they are joined by Eden and David who bring to the small scale reunion that of an awkward shift. There is a history between Will and Eden, there is an anxiety in the two of them coming face to face once more that is palpable in their friends' stares and body language. As Kusama slowly begins to unravel the histories of her ensemble cast while also introducing the likes of Pruitt (the forever great John Carroll Lynch), a man with a disturbing past he doesn't mind owning up to, as well as the clearly unstable Sadie (Lindsay Burdge) things begin to go in directions where the reality of what is actually occurring is the least clear thing in the room. 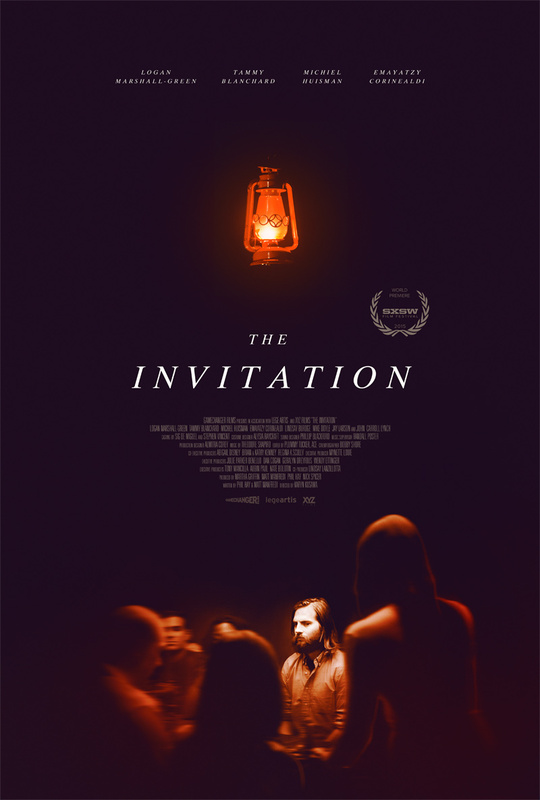 Much of what makes The Invitation enticing is its ability to keep the audience on the hook for its slow burn while only occasionally slipping into moments where one might disengage. This brings to light the only overbearing issue with the film and this is being said after only viewing the film a single time. I could very much see how, with repeated viewings, this technique could open itself up to being not only calculated and precise, but the best choice for the overall development of the plot and the characters-especially considering the descent into the surreal we're to believe we're going on. The overall effectiveness of the slow burn is accomplished through many factors, naturally, but that it is able to be accomplished at all while remaining largely entertaining or rather entrancing is the real pleasure one gets from witnessing this film unfold. Whether it be in the stilted awkwardness the actors convincingly convey or the confined, single location that adds to the already strained tone a claustrophobic feeling there is always something to question, something to wonder, and something to think you've figured out before Kusama and her script come along and decide to throw such expectations for a loop. There is something off about the whole affair and Will recognizes as much from the get-go, but the remainder of those in attendance would simply like to believe in the niceties of their hosts. The question The Invitation asks is at what point do we begin to look past the pleasantries and question what we're fed beyond the surface of simply what it seems to be. Will is there from the beginning. The audience has to decide if we're with him or if what he's seeing is all in his mind. Kusama plays this line nicely by largely delivering the film through Will's perspective, but occasionally backing up just enough to make us wonder. In short, it's a technique that guarantees we remain not only engaged, but hooked. David (Michiel Huisman) and Eden (Tammy Blanchard) attempt to pull their estranged friends into a certain way of life that has allowed them to move past certain loss and pain they have experienced. There is much to discuss about the film, but unfortunately large portions of those discussions would spoil major aspects for those that may be reading this, but have yet to see it. And so, to talk about the layers in which the present situation and the characters actions in this situation mirror their journeys is to talk mostly about the performances themselves. For starters, Marshall-Green (who looks uncannily like Tom Hardy) is the ringleader here as he serves both as the protagonist and our surrogate. It is only once Kusama begins to frame things in certain lights that we begin to wonder whether or not Marshall-Green's Will is reading too much into things. As far as his performance is concerned though, the man plays his baffled and skeptical Will as a man constantly attempting to comprehend this overwhelming sense of loss in his life. As portrayed by Marshall-Green we never know if Will is attempting to grapple with these emotions for the sake of never coming in contact with them again or for reasons of trying to weigh the good with the bad to figure out if there is even a point to it all. It is both a complicated and unsettling arc to play. To always be walking a tightrope. Through the pure emotion his face emits, namely his dark eyes, and some very specific shot and editing choices that are composed at just the right time and in just the right order we not only feel the pain Will is experiencing, but we feel how he is dealing with it and thus we are forced to wonder just how ably his perspective serves us. Pair with this the icy cold severity present in Blanchard's Eden and the prickly pretense that is written all over Huisman's mug who together clearly have ulterior motives we simply aren't privy to and one already has a dangerous batch of chemicals in the mix. Lynch only adds to the strained spirit of the night in a single scene where he confesses to his past sins that would immediately signal it is time to leave for any sane person, but within the context of a movie this scene stands to be something of the catalyst for the inevitable doom. The Invitation is a rigid, meticulous piece of filmmaking that makes up for its few shortcomings with unbridled craft. It would be a shame were one to RSVP no.